This is the inaugural Freelancing Spotlight column from CopyPress. My name is Derek Miller, and I’m the Community Growth Manager for CopyPress’ talent network of freelance writers, editors, influencers, designers, and developers (Join our team!). As a freelancer and someone who works with freelancers on a daily basis, I thought it would be worthwhile to educate and inspire other freelancers through a series of informational posts. The Freelancing Spotlight will include industry thought-leaders, internal team members at CopyPress, and freelancers. Our hope is to provide other freelancers and those interested in starting a freelancing career with a new perspective to help set clear and realistic expectations for what life is like as a freelancer. 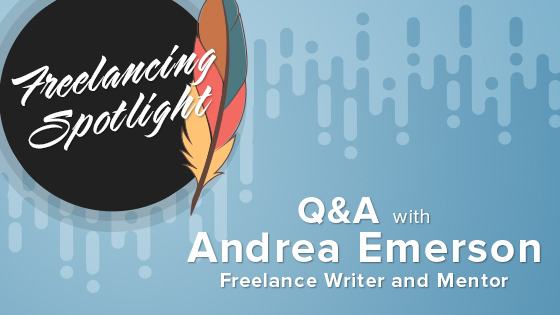 My first guest is Andrea Emerson, a freelance writer, mentor, and moderator of the Facebook Group Freelance B2B Writers. If you would like to nominate someone to feature in an upcoming Spotlight article, please email me at dmiller@copypress.com or reach out on Twitter. I worked in various corporate marketing and PR roles for about 15 years, with content production being my favorite part of every job I ever had. There wasn’t a single factor that drove me to freelance, but a perfect storm of them. For one, I realized I had very little control over my time and the types of projects and people I got to work with. Even my career progression was limited to what my employer judged best to their interests, and I had to wait and wait for promotions. Toward the end, tasks I didn’t enjoy (like analytics, spreadsheets, meetings galore) were taking over my days and crowding out the parts of the job I did love. At the same time, my parents got sick, I was missing out on my kids’ activities, and craved more time with my family. I realized the “fix” to these problems was to be my own boss, so I left to freelance full-time as a content writer. Within a few months, fellow freelancers in my hometown pointed out the level of success I was having wasn’t “normal” and began coming to me for advice — that’s how I fell into mentoring. Do you still write or is mentorship your main focus? Writing remains my main focus. I wouldn’t trust advice from a mentor who’s not in the trenches with you, experiencing market shifts as they happen. Industry demands, trends, opportunities, buyer behavior, technology tools… those things are always evolving, and someone who’s out of the game isn’t equipped to help steer your business. Can you elaborate on why you decided to offer mentorship instead of just writing? When I began freelancing, I made it a habit to connect with local freelancers over coffee or lunch. It soon became clear that I had an easier time than most keeping my pipeline full and workload steady. I thought the tactics I was using were just common sense, but that’s probably because I’d “grown up” in the marketing realm and had hired many freelancers in my past roles. I knew how prospects think and make decisions, because I’d been one of them. The lightbulb moment was realizing that practices I thought were common knowledge weren’t, and freelancing friends kept coming back for advice. Pros: Massive control over what/how/where/when I work, whom I work with, my income potential, and career progression. If I decide tomorrow that I no longer want to take on a type of project, or if I want to try a new industry or raise my prices, I can do that. If I decide a client is sucking my soul and I don’t want to work with them anymore, I can do that too. I can show up for a mid-day presentation at my daughter’s school, and go care for my parents overseas when they’re ill.
Cons: That level of flexibility means work and personal life tend to bleed into one another. You have to set good boundaries so clients don’t feel they can reach you anywhere/any time. Taxes and bookkeeping are a pain. (I outsource both to keep my involvement minimal.) Health insurance can be pricey if you’re based in the U.S. I’m still on my husband’s insurance, but many freelancers don’t have that luxury. Since you started your business, what, if anything, has changed the most within the freelance writing industry? The feedback I’ve received from big-budget clients is that they crave long-form, journalistic-style writing, but have trouble finding skilled long-form writers. “Everyone else is a blogger,” one client told me. Interestingly, I’m also seeing a lot of journalists jumping over to the content marketing side or writing for both industries. This is consistent with reports I’ve seen come out of the Content Marketing Institute, and industry data on the effectiveness of long-form content. I have no doubt artificial intelligence (AI) is the next big thing in content marketing, and I already see some of that happening with interactive content, behavioral targeting, and personalization. I’m devoting the next few months to learning as much as I can about it ⎯ it’s the theme of my journalism capstone at Harvard (the final piece toward my master’s degree). I’m hopeful that AI will create opportunities, rather than take jobs away from freelancers, but it will require us to build or sharpen different skills, such as strategy. You moderate an active and growing Facebook group. Can you tell us a little about why you started that group and some of the lessons you’ve learned with that project? The group was, in large part, an experiment. I met Jill Stanton of Screw The Nine to Five at a conference, and she encouraged me to start a group as a way to better understand my audience, provide value, and cultivate relationships. It’s exceedingly rare that I pitch any paid mentoring to the group, and I think that’s one reason why it’s been successful. Members expect to be helped, not sold. Curiously, Jill later shut down her own 45,000-member group when members began spamming the group. She then started a new group from scratch where members could only do three things: Ask, Praise, Give. I think that’s brilliant, and I try to encourage those behaviors in my group. Then I’d teach them some tell-tale signs of prospects who are already “pre-sold” in a sense: They value content and have a healthy budget for it. (Short version: They have a marketing department or director.) Finally, I’d advise them to aim for retainer arrangements, which is the closest a freelancer can get to a steady paycheck. I believe freelance writers should continuously improve their writing AND their business management skills, including sales. Often, freelancers focus on one side (either their craft or the business) and neglect the other. A good product (your writing) won’t market itself, and great marketing will only kill a bad product faster. Copyhackers, Copyblogger, and the Content Marketing Institute are great resources for growing your writing muscle and know-how of industry best practices. Ed Gandia, Sarah Greesonbach, and Steve Slaunwhite all give out solid, actionable advice for building a profitable freelance business. Where can I find Andrea Emerson?